My most recent notable meal out in London this week (it was actually last week!) was at The Detox Kitchen in celebration of the launch of their new book, The Detox Kitchen Bible. Myself along with a few friends were invited for an intimate meal at their Kingly Street deli. We were all given a book each with a personalised card waiting for us on the table. The lovely people at The Detox Kitchen had placed tabs in everyones book marking 3 recipes that they think we will like – a kind and thoughtful gesture. Mine were Mango Soya Yogurt, Quinoa Pizza, and Beetroot and Carrot Tagine, all of which I’m looking forward to making! 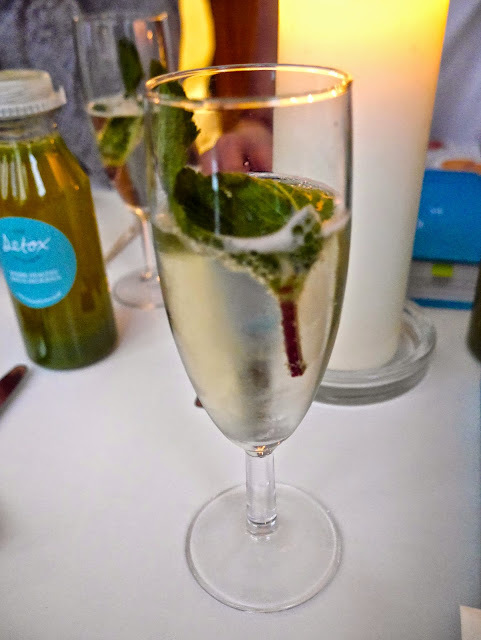 We started off with a glass of sparkling with fresh mint, shortly followed by the starters. Aubergine stacks with a tomato sauce, soya yogurt, and pomegranate. It was absolutely delicious! I’m looking forward to trying this one out from the recipe book. Next we were served our main courses. It was a scrumptious concoction of roasted veggies, avocado and mango salsa (and chicken for everyone else). The mango salsa was so refreshing it’s triggered a new obsession with mango! After we cleared our plates clean, desserts were followed. We had banana bread (a vegan version for me) and delicious truffles. The banana bread was moist and full of flavour and the truffles had this amazing smooth and creamy texture – I definitely could have gobbled down the whole lot! The amazing thing about eating this way is that even after 3 courses, I felt like I had eaten the perfect amount and didn’t feel uncomfortably full like I’d over eaten. Everything we ate tasted amazing yet was incredibly healthy. You can pre-order their book here, which is out on 7th May. They currently have 2 delis, one at 10 Kingly Street and one on the 5th floor of Harvey Nichols. I’ve already been to both and I’ll definitely be going back again soon!